Ottawa’s QNX Software Systems, a subsidiary of Research in Motion, is unleashing a series of automotive technology-related offerings at the Consumer Electronics Showcase this week in Las Vegas. Among the QNX announcements at CES are a new technology concept car, version 2.0 of the QNX CAR application platform, and a new speech framework for in-car voice recognition. While we’re still a little ways off from KITT of Knight Rider-levels of interactivity with our cars, QNX has launched a new framework for in-car speech recognition. A component of the QNX CAR application platform, the framework allows in-car applications to access AT&T Watson speech recognition technology. The combination will allow developers to create more intuitive and functional interactive voice applications for automobiles. 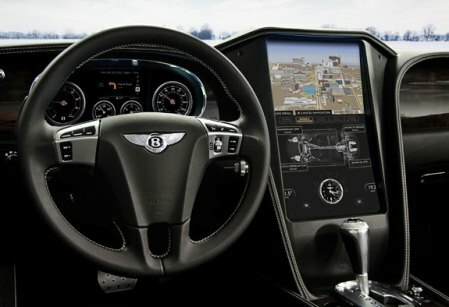 QNX brought a Bentley Continental GT convertible to Las Vegas as a concept car to show off some of the capabilities of its CAR application platform 2.0, and its “connected cockpit” of tomorrow. It includes a centre stack DLP display from Texas Instruments with HD graphics and 3D navigation. By saying “Hello, Bentley” a driver can interact with the car using the QNX/AT&T Watson platform – and of course, the car has a British accent. There’s also smartphone integration, multimedia entertainment, a web app for remote monitoring of data such as tire pressure, video conferencing, and a reconfigurable digital instrument panel. The Bentley’s centre stack. (Courtesy QNX). 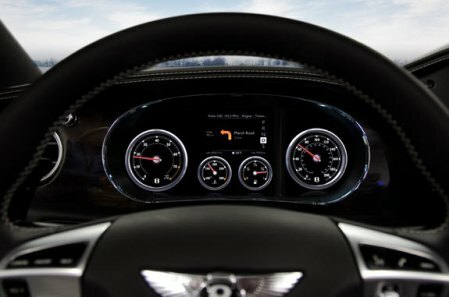 The Bentley’s customizable dash (Courtesy QNX).